Upcoming spin-off title Persona Q: Shadow of the Labyrinth is getting its own emblazoned 3DS XL. This is it. Well, the back of it, anyway. As you can see, it reads "3DS LL" because in Japan, "XL" is called the "LL." I like how you have to turn it on its side to read it—like a Persona book. Very cool! 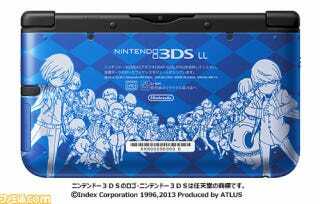 Priced at 25,380 yen ($250) and bundled with the game, the limited edition Persona 3DS XL will go on sale this June in Japan. No word on a Western release. For more details on Persona Q: Shadow of the Labyrinth, Kinja user Aestevalis has a rundown.